Author(s): Camila Hernandes, Ana Maria Soares Pereira, Patricia Severino. Albert Einstein Research and Education Institute, Hospital Israelita Albert Einstein, Av. Albert Einstein, 627, 05652-000, Sao Paulo, SP, Brazil. Squamous cell carcinoma of the head and neck is one of the most common cancer types worldwide. It initiates on the epithelial lining of the upper aerodigestive tract, at most instances as a consequence of tobacco and alcohol consumption. Treatment options based on conventional therapies or targeted therapies under development have limited efficacy due to multiple genetic alterations typically found in this cancer type. Natural products derived from plants often possess biological activities that may be valuable in the development of new therapeutic agents for cancer treatment. Several genera from the family Celastraceae have been studied in this context. This review reports studies on chemical constituents isolated from species from the Celastraceae family targeting cancer mechanisms studied to date. These results are then correlated with molecular characteristics of head and neck squamous cell carcinoma in an attempt to identify constituents with potential application in the treatment of this complex disease at the molecular level. Keywords: Celastraceae, Triterpenoids, Quinone-methides, Cancer, Head and neck squamous cell carcinoma, Targeted therapy. Affiliation:Albert Einstein Research and Education Institute, Hospital Israelita Albert Einstein, Av. Albert Einstein, 627, 05652-000, Sao Paulo, SP, Brazil. Keywords:Celastraceae, Triterpenoids, Quinone-methides, Cancer, Head and neck squamous cell carcinoma, Targeted therapy. Abstract:Squamous cell carcinoma of the head and neck is one of the most common cancer types worldwide. It initiates on the epithelial lining of the upper aerodigestive tract, at most instances as a consequence of tobacco and alcohol consumption. Treatment options based on conventional therapies or targeted therapies under development have limited efficacy due to multiple genetic alterations typically found in this cancer type. 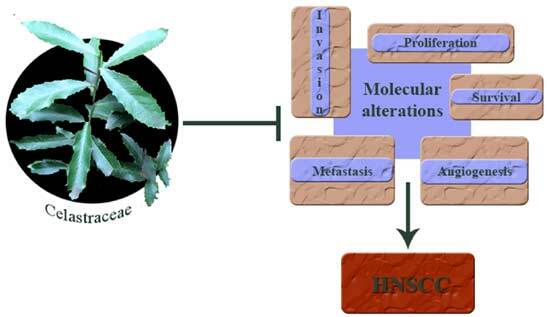 Natural products derived from plants often possess biological activities that may be valuable in the development of new therapeutic agents for cancer treatment. Several genera from the family Celastraceae have been studied in this context. This review reports studies on chemical constituents isolated from species from the Celastraceae family targeting cancer mechanisms studied to date. These results are then correlated with molecular characteristics of head and neck squamous cell carcinoma in an attempt to identify constituents with potential application in the treatment of this complex disease at the molecular level.